Oliebollen (plural for Oliebol) means “oil ball”. It is a seasonal treat that is traditionally made and served on New Year’s Eve in The Netherlands. 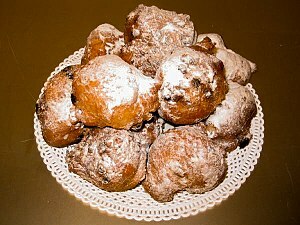 Oliebollen is usually made with currants and raisins, and sometimes chopped apples. Recipes differ over the use of either baking powder or yeast in the preparation process. I prefer the baking powder version as I am not good at making yeast products. I made these last night, for the first time. They turned out rlleay good. My recipe made 40, so I brought them to church for coffee time. We have several Dutch people who I thought would rlleay enjoy them. Not only did they enjoy them but several non Dutch people did as well. I had people asking me for more and some who missed out on them totally.I probably could’ve made a double batch! I do not like deep frying but the Dutch croquettes,with leftover turkey, and now oliebollen,make it worth it once a year.